A well planned, well maintained school website offers considerable benefits to teachers, pupils, parents and the wider community. A school website is an excellent way to promote the positives of a school and can be a marvellous public relations tool. It can showcase student achievements and projects; provide valuable information & Web links for students, teachers, and parents; and also give an overview of the goals, policies and curriculum of a school. As experts in WordPress web design, we can build you a low cost school wbesite solution which will deliver massive benefits from both an educational, communication and information perspective. We offer offer a number of brilliant school website packages to suit the needs of all schools – big or small, primary or secondary, state or independent. Whatever your budget, we’ll find a solution which will ensure your school has an online presence which will be the envy of others. 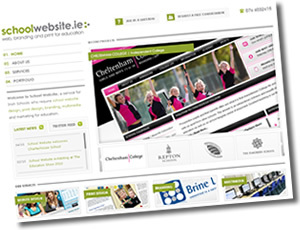 To find out more about our school website design services, just contact us on 067 56670 or online via our Quick Contact Form which you’ll find on the right sidebar. If you want an immediate quote, please fill in our Quote Form and we’ll revert to you within 24 hours.